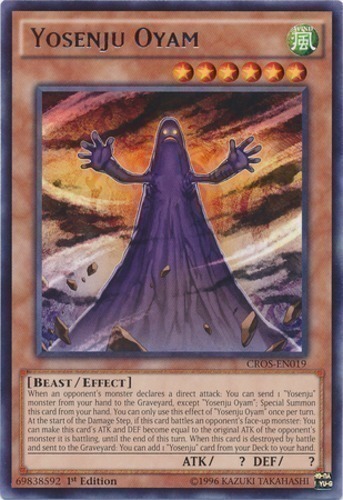 When an opponent's monster declares a direct attack: You can send 1 "Yosenju" monster from your hand to the Graveyard, except "Yosenju Oyam"; Special Summon this card from your hand. You can only use this effect of "Yosenju Oyam" once per turn. At the start of the Damage Step, if this card battles an opponent's face-up monster: You can make this card's ATK and DEF become equal to the original ATK of the opponent's monster it is battling, until the end of this turn. When this card is destroyed by battle and sent to the Graveyard: You can add 1 "Yosenju" card from your Deck to your hand.